​TIC BALI Online Reservation Centre offers up-to-date and accurate information about all the fast boat services from Bali to the surrounding islands, which operates with online reservations and booking service. You can find schedules and timetables, boat specifications, picture galleries and price comparisons. We are currently the only independent company working with every fast boat operator and can therefore offer tailor made packages with bigger discounts and even open return tickets on different services. Choose the best option of boat transport from anywhere in Bali to the Gili Islands of Trawangan, Meno and Air, mainland Lombok or Nusa Lembongan. Situated a short trip away from Bali are many small coral fringing islands. With white sandy beaches, swaying palm trees,crystal clear turquoise waters, these paradise islands are perfect or divers, snorkelers, surfers, families and backpackers. These tropical paradise islands just got closer with several comfortable fast boats operating these routes with daily and twice daily services in the busy seasons. Scoot Fast Cruises is the safest and most comfortable way to travel from Sanur to Nusa Lembongan, Lombok and the Gili islands. Our route from Sanur goes directly to Nusa Lembongan then stops briefly before heading off to Senggigi in Lombok. From here we then travel on to the Gili islands, so that our passengers are relaxing on the white sandy beaches within hours of departing Bali – and without the lengthy road trip to Padang Bai. The staff are highly experienced and well trained to ensure our guests always travel safely with Scoot Fast Cruises. 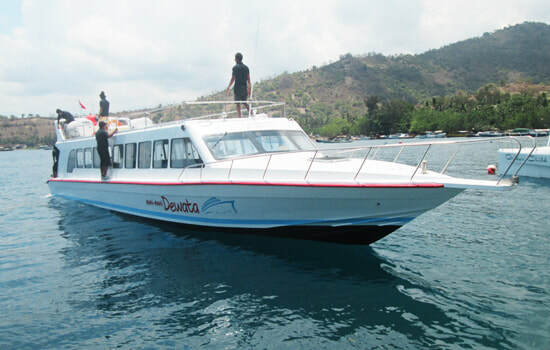 Provides high quality fast boat to Gili island and Lombok, with complete safety facilities and great comfort. ​Boat carries 70 passengers and professional crew . 5x250 HP of Suzuki engine, plus radio beacon, VHF radio, distress flares and GPS system, including for emergency. SOLAS life jacket for each passenger, throw rings, plus 3x25 meters of life rafts, inflate when the boat sinks or can be inflated manually.The boat also has ​Sun deck roof & toilet. Mahi Mahi Dewata makes sure that all passengers step out of the boat with satisfied feeling. Mahi Mahi Dewata is also proud to say that the company has so far maintained to keep the 100% safety record. Morning trip depart from Padang Bai at 09.15 for Gili Trawangan destination (with Semaya One Dream with 173 passenger capacity). It's will take approximately 1 hour and 30 minutes from Padang Bai to Gili Trawangan. Afternoon trip depart from Padang Bai at 13:00 and will arrive at Gili Trawangan approximately at 14:30 (use fast boat Semaya One Romatica with 90 passenger capacity). ​All our fast boats include safety equipment, toilet on board, complimentary mineral water and very helpful staff. ​The Boat operator from Bali to Nusa Lembongan. With a fleet of fast boats, it's take only 30 minutes from Sanur Beach to Lembongan. Also provide a complete transfer service from your accommodation to your accommodation on the island of Lembongan and return. All boats full insurance cover, life rats, life jacket, ring buoys, gps system 3 in 1, fully accredited captains and crews, special fast boat with seat design, fire extinguisher, marine vhf radio, first aid kit.